Kem P. Krueger, Pharm.D., Ph.D.
Dr Krueger has spent eight years conducting pharmacoeconomic and outcomes research, specifically measuring the clinical and economic impact of pharmacy services, modeling disease interventions, and validating disease state models. He received his Doctor of Pharmacy degree from the University of Missouri--Kansas City in 1993. He then completed a general pharmacy practice residency at the Kansas City Veterans Administration Medical Center. Following the residency, He completed his Ph.D. at The University of Arizona. He has experience in hospital pharmacy, independent pharmacy, and chain pharmacy settings. He also worked for the US Public Health Service, and for Marion Merrell Dow Inc. in the Health Economic and the Global Scientific Competitive Intelligence departments. He has been at the University of Wyoming since August 2005, and is a research affiliate of HCMS in Cheyenne, WY. He was on faculty at Auburn University for seven years prior to joining the University of Wyoming, School of Pharmacy. 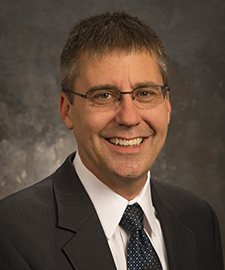 Dean Kem Krueger, Pharm.D., Ph.D.